Rodney Smith, has been a stalwart of the UK underground scene for over two decades, with his unique blend of jumpy, unorthodox beats and provocative, yet witty, vocals. His latest, Bleeds, is just as genre defying as his five previous LPs, flitting between lush keyboards, semi-gospel choirs and dark, menacing beats,though never losing his distinctive and dominant presence. Fans who feared the rapper may have lost his edge after a four-year hiatus, and the relocation from his hometown of London to the leafy Surrey, will not be disappointed: if anything, Bleeds is his darkest, most brooding album to date. Opening track ‘Hard Bastards’ launches into a scathing social commentary on the country’s rising inequality, unemployment and out-of-touch ruling classes, as he laments how “TVs and magazines keepthem kinda hopeful that one day, in some way, they’ll get a lucky break,in the meantime that plant food provides a cheap escape”. Despite itsmusical diversity, this gloomy tone isconsistent throughout all 10 tracks, leaving a record fittingly mature for the 43-year-old. That said, it is hard not to miss the quirky sense of humour that made his first two albums so appealing. Roots also takes a backseat with the production, choosing instead to leave the task to a few carefully selected and forward-thinking producers.Highlights include ‘Facety 2:11’, on which the artist masterfully rides a difficult and powerful Four Tet beat, proving his technical skill to be alive and well. ‘Don’t Breathe Out’ is another stand-out track, a hauntingly beautiful hip-hop/disco hybrid with a seductive Barry White sample. 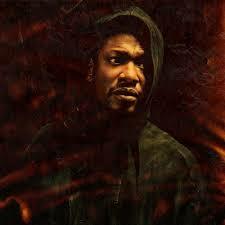 Regardless of collaborations and samples, Bleeds is unmistakably Roots Manuva, albeit in a more urgent and sombre form. For all its musical accomplishments, the record verges on cold and preachy in places, and listeners may find it more difficult to warm to than his previous efforts.